They have killed countless innocent members of the Armed Forces and destroyed the lives of 1000’s of others and yet their families are bleating on about the poor dears getting a taste of their own medicine. It infuriates me that a law firm would even consider representing these murderers and their families. They choose to live by the sword and they died by the sword and good riddance to them. The Provisional IRA East Tyrone Brigade was active mainly in eastern County Tyrone and neighbouring parts of County Armagh. By the mid-1980s it had become one of the IRA’s most professional and effective units. Members of the unit, such as Jim Lynagh and Pádraig McKearney, advocated a strategy of destroying bases and preventing them being rebuilt or repaired, thus “denying ground” to British forces. In 1985, Patrick Joseph Kelly became its commander and began implementing the strategy. In 1985 and 1986, it carried out two major attacks on RUC bases described by author Mark Urban as “spectaculars”. The first was an attack on the RUC barracks in Ballygawley on 7 December 1985. The second was an attack on an RUC base at The Birches on 11 August 1986. In both attacks, the bases were raked with gunfire and then destroyed with a bomb. In the attack at The Birches, they had breached the base’s perimeter fence with a digger that had a bomb in its bucket. 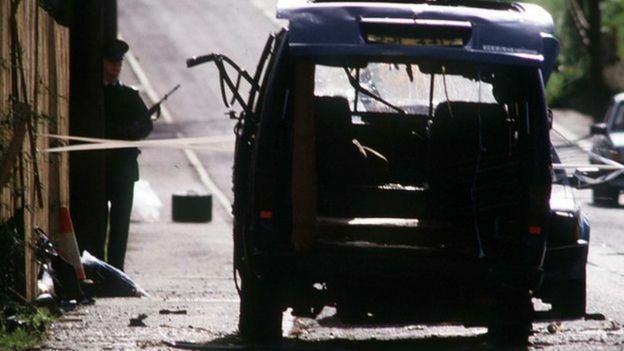 It planned to use the same tactic in an attack on the lightly-manned Loughgall base. The British security forces, however, had received detailed and accurate intelligence about the IRA’s plans. It is believed that this was obtained by RUC Special Branch and the British Army’s Special Reconnaissance Unit (SRU). It has been alleged that the security forces had a double agent inside the IRA unit, and that he was killed by the SAS in the ambush. Other sources claim that the security forces had instead learned of the ambush through other surveillance methods. On 7 May, the RUC base was secretly evacuated and about 36 SAS soldiers, as well as officers from the RUC’s Mobile Support Unit (MSU), were deployed. The MSU was the RUC’s equivalent of the SAS. Most of the soldiers and officers were hidden around the base, with one team inside and others hidden along the IRA’s anticipated route. The IRA’s attack involved two teams. One team would drive a digger with a bomb in its bucket through the base’s perimeter fence and light the fuse. At the same time, the other would arrive in a van and open fire on the base. Both teams would then leave the area in the van. The van and digger that would be used were hijacked in the hours leading up to the attack. The van, a blue Toyota HiAce, was taken from a business in Dungannon. The digger (a backhoe loader) was taken from a farm at Lislasly Road, about two miles west of Loughgall. Two IRA members stayed at the farm to stop the owners raising the alarm. IRA member Declan Arthurs drove the digger, while two others drove ahead of him in a scout car. The rest of the unit travelled in the van from another location, presumably also with a scout car. The two IRA teams arrived in Loughgall from the northeast shortly after 7PM. All were armed and wearing bulletproof vests, boilersuits, gloves and balaclavas. The IRA men drove past the RUC base a number of times for reconnaissance. At about 7:15, Declan Arthurs drove the digger towards the base, with Gerard O’Callaghan and Tony Gormley riding alongside. In the front bucket was 200 lb (90 kg) of semtex inside an oil drum, wired to two 40-second fuses. The other five followed in the van: unit commander Patrick Kelly, Jim Lynagh, Pádraig McKearney, Eugene Kelly and Seamus Donnelly. The digger crashed through the fence and the fuses were lit. The van stopped a short distance ahead and—according to the British security forces—three of the team jumped out and fired on the building. Author Raymond Murray, however, disputes this. Within seconds, the SAS opened fire from a number of hidden positions with M16 and H&K G3 rifles and L7A2 general-purpose machine guns. The bomb detonated, destroying the digger along with much of the building, and injuring three members of the security forces. The SAS fired about 1,200 rounds at the IRA unit, riddling the van with bullets. The eight IRA members were killed in the hail of gunfire; all had multiple wounds and were shot in the head. Seamus Donnelly managed to escape into the football field beside the road, but was shot dead there. It has been alleged that three of the wounded IRA members were shot dead as they lay on the ground after surrendering. According to author Raymond Murray, citing Jim Cusack’s article in The Irish Times of 5 June 1987, the IRA members in the scout cars escaped. Two civilians travelling in a car were also shot by the SAS. The two brothers, Anthony and Oliver Hughes, were driving back from work and were wearing blue overalls like the IRA unit. About 130 yards from the base, SAS members opened fire on them from behind, killing Anthony (the driver) and badly wounding Oliver. The SAS fired about 50 rounds at them from a garden. The villagers had not been told of the operation and no attempt had been made to evacuate anyone, or to seal-off the ambush zone, as this might have alerted the IRA. Anthony’s widow was later compensated by the British Government for the death of her husband. Shortly after the ambush the Provisional IRA released a statement saying: “volunteers who shot their way out of the ambush and escaped saw other volunteers being shot on the ground after being captured”. 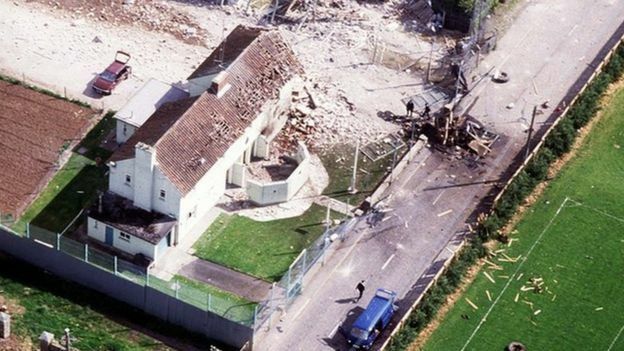 In 2001 the European Court of Human Rights ruled that ten IRA members, including the eight killed at Loughgall, had their human rights violated by the failure of the British Government to conduct a proper investigation into their deaths. The court did not make any finding that these deaths amounted to unlawful killing. 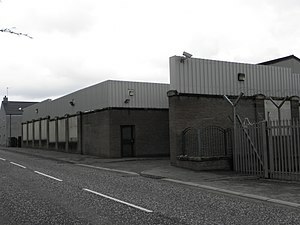 In December 2011, Northern Ireland’s Historical Enquiries Team found that not only did the IRA team fire first but that they could not have been safely arrested. They concluded that the SAS were justified in opening fire.